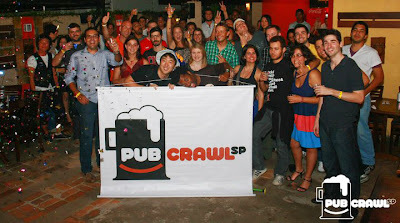 Inside São Paulo: Finally, a great Pub Crawl Service in Sao Paulo. Check it out! Finally, a great Pub Crawl Service in Sao Paulo. Check it out! São Paulo is a huge city and offers as many options as your mind can create, but, there was something missing. Something that not everyone knows about, but irreplaceable for those already familiar with it. 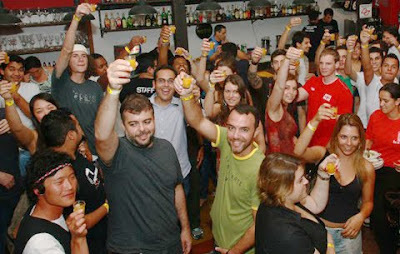 Amazingly, until the begin of this year, São Paulo wasn't able to offer a Pub Crawl service as those found in Europe. But now, it is fixed. Those who already had a chance to come to São Paulo knows that the life can be hard if you don't know a little bit of Portuguese (as in anywhere else in Brazil). 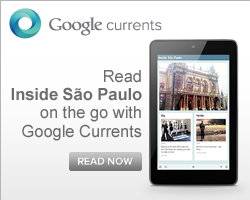 That's why insidesaopaulo came along. Despite São Paulo has plenty of features and places to go, there were not a sort of guidance about how to behave and most of all: how to party in Brazil. 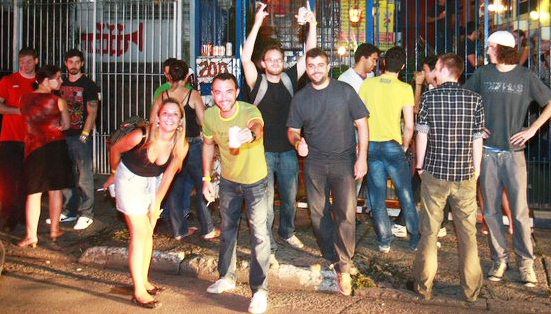 It's interesting to see how we, Brazilians, organize ourselves in order to pay bills inside bars, go out for a cigarette and also, how to approach and interact with local people. I mean, it's worth to have a help. Pub Crawl SP fulfills a lack in touristic services in São Paulo: how could the biggest city of South America with a well-known gastronomy and nightlife not have a Pub Crawl service? 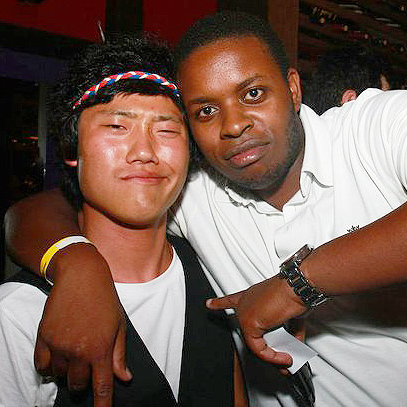 That’s Pub Crawl spirit: bring people to have fun, meet new friends and explore the best of the city. We from insidesaopaulo had a chance to try out this experience to say if it works or not. It definitely works! The Pub Crawl's staff is absolutely helpful and aware about any single detail. Everyone speaks fluently at least two languages, including: English, Spanish, Korean, French and Portuguese, off course. This staff has already traveled around the world and knows what means to be passing through a busy city. As I said above, not everyone knows this way of service, but this is the event's blueprint. Basically these guys have already organized about 4 different places to take a group for a visit. Each tour can bring a group of around 50 people (max.). There is a meeting point (you will find out with them as soon as you book it) where they serve free drink and food for at least one hour. After that the tour begins. Some nightclubs and bars in São Paulo charge for the entrance (it can range from R$ 15 to R$ 50 each) but you will get in for free. The tour ensures your entrance on the pubs, which means free admission to different bars and in anyone of them, you'll receive a complimentary welcome shot. The tour offers security guards service and also a photographer to register all the moments of the night. There is also also a bus (if necessary) to take everyone to the next destination. 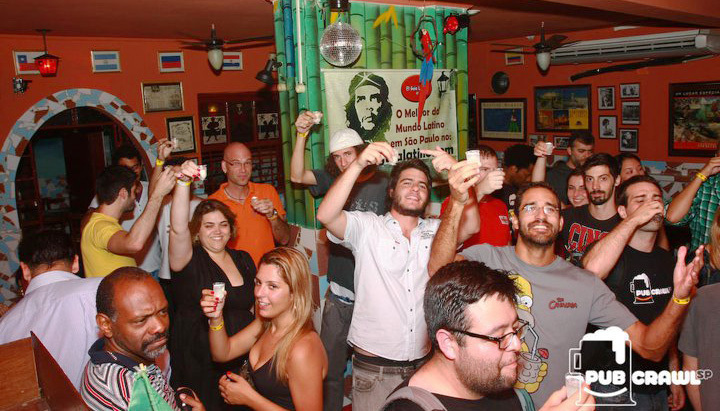 The party ends in some of the best nightclubs of São Paulo. The price is R$ 50 in advance and R$ 60 without booking. Apart of the welcome party (where you will have as much food and drink as you want), it'll be necessary to buy all the drinks you will have during the night. It's worth because it would be at least double more expensive in order to visit the same places. Actually, it's priceless because the staff is absolutely kind and ready to help. It's also a way of meeting new people in the same situation as you are. During the night, you can talk to overseas and Brazilians, and also, will meet plenty of local people on every pub. Insidesaopaulo deeply recommends this tour by the value for money of the service. Have a try and come back to say what you want. How to join: You can make your reservation directly at the website, call them or send an email. How much: R$ 50 in advance or R$ 60 without booking. It's cash only.